For 2019, Levi’s® continues to build out the tapered jeans collection line up. This season, we’re amping up the style offering by including piecing, paneling and street-inspired novelty. “With the casualization trend and streetwear and sneaker culture booming, taper fits are super important this season. We have an incredible and expanded portfolio of taper fits this season”—Karyn Hillman, Chief Product Office at Levi’s Strauss & Co. The Levi’s® Men’s Taper is also expanding with our ever-popular streetwear-inspired style: the Hi-Ball Roll. 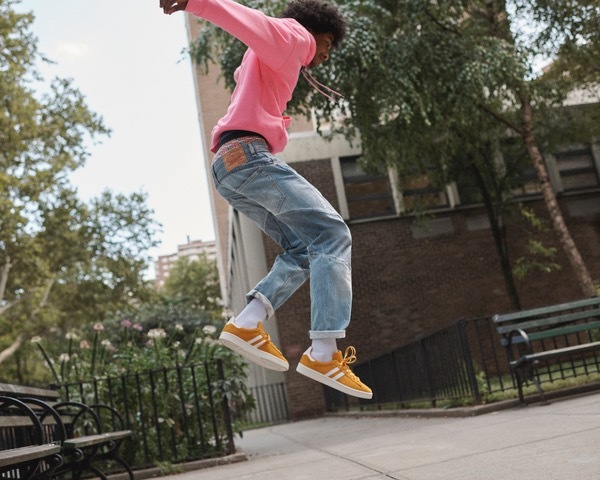 These jeans celebrate sneaker culture which is why last season, Levi’s® created the pre-cuffed version, the Hi-Ball Roll offered in our 502™ Taper fit. These jeans are all about maximum footwear capability. After all, no one wants a pant leg getting in the way of their fresh new kicks. The Hi-Ball Roll will be offered in a range of stretch and soft fabrics, including Tencel® Lyocell and our new Z-Twist, as we continue to diversify our comfort benefits. Designed to show off the most important of features—a hype-worthy pair of sneakers. The Hi-Ball has the body of the classic 502™ Taper and pre-cuffed to help guys achieve that perfect cropped length and show off their stylish kicks. New this season, Levi’s® Introduces the Hi-Ball in Coho Creek Moto and Stoned Poppy.